It's been a while since I last posted, so here are some updates. Last week was my first full week off from teaching since Christmas/New Years, so it was so nice to stay home and work in my studio. I've decided this year is the Year of Glass and Stone, so my work is heavy on glass and gemstones. I wanted to let the glass artist in me out, and also get a grip on my stone collection. Most of us jewelers and goldsmiths tend to be gem junkies, and I'm no exception. As a result, I have way too many stones and I gotta set them all! I've vowed to get half of my stones set this year, so that's spurring me on. In that one week I stayed home, I have made more bezels than I've ever done in a short period. Will have lots of lovely gemmy rings for Sunapee, which is about 6 weeks from now. Yuks!! Will I be ready? I don't know but I always managed to get it all together for opening day which is Aug 4 this year. When I'm in class, my hands are restless, so I can be found often wire knitting or doing something mindless as I watch my students. In the past few weeks, I've found myself doodling in wire, so here's a sampling of my wire doodles. 22g. seems to be the best overall wire size. 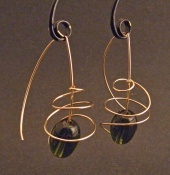 I've made a lot of spirally, low tech earrings out of goldplated wire and sterling wire, as seen in the goldplated spirally hoops and spirally earrings with green glass beads. 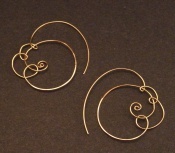 Since I can't be in my studio very much or be able to solder, I've developed a small line of low tech earrings that only requires one piece of wire, and bend it into an earring, and sometimes hammer it. 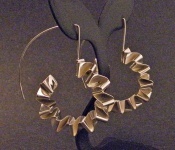 The Paper Clip earrings have turned out to be pretty popular. Another twist I've been doing is that I often find vintage jewelry or metal parts, and once in a while, will acquire a lot of old tools and jewelry parts. Anyways, there was a length of sterling chain, circa 70's, in a dated cable link style that was too dog-collary for me, so I was able to flatten the links and hammer them to give them a more handcrafted look. Great way to update a dated chain or piece of jewelry. Never hurts to tweak or alter a commercial product to make it more one of a kind. I've gotten good at doing that. I also had a piece of 1/4" silver bezel strip that was sterling, not fine silver, so being stuck with it, I started plaiting it, and ended up with several pairs of plaited hoop earrings. It was one of those things I was like, why did I get it in the first place? Life gives you lemons, make lemonade out of them. Same thing in jewelry/metalworking - got some weird stuff? Repurpose it and you'll have some great products. Well, in a few days, I'll be winging off to California to teach. My first out of New England teaching gig. I really want to expand beyond the East Coast and try other places to teach. All I ask is that my airfare or traveling expenses, and lodging expenses to be covered, and I'll be happy to teach.